Last week I had the great pleasure of attending a two-day live retreat hosted by Fabienne and Derek Frederickson, founders of the Client Attraction Business School, where I’m learning how to grow my business. As part of the retreat, we were challenged to come in costume for a fun-filled evening of dance and treats. As I pondered my options (what could I do in 30 minutes before I closed my suitcase and headed to bed) I decided to go as Sister Mary Conflicta, who is facing a dilemma about her vocation. 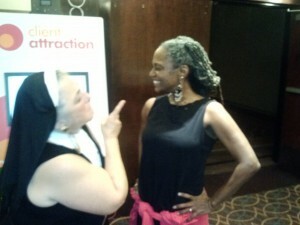 Sister didn’t have much success scolding classmate Theresa Caldwell for her wild dancing, thank goodness! But “she” was remembered and celebrated by other classmates, who’ve come to know me as the actor who used to be a teaching nun. So what does that have to do with growing my business as a speaking coach? So over time, I’ve incorporated that into my introductions, but it didn’t really connect until yesterday, when my coach encouraged me to get very clear on what benefits my clients will get from overcoming their fear of speaking in public. And here’s what came to me: I’m Terry Nicholetti. I used to be a teaching nun who kept a vow of silence at night for five years. Now I’m a professional actor, author and speaking coach, with over 30 years experience in sales and marketing. I found my voice! And I love showing you how to find yours, and how to use speaking in public to increase and strengthen your own success. CONNECT with others using your authentic voice. So a former teaching nun shows you the A, B, C’s of successful public speaking! Now, I can almost hear some of you say, but I’m not a former nun! Don’t let that stop you. Let it inspire you to take some time and ask yourself, “What in my story makes me memorable? What about me is different from most other people I meet? How does that connect with the benefit I offer to my prospects, my clients, my listeners? How can I incorporate that into my marketing message or my introductions? It will take you some time but it will be well worth it! Just received your free gifts, and found them both inspiring. I love the song parady! This article, too, is very helpful. Thanks, Terry, for sharing your brilliance.